Despite not having an official presence at Comic-Con, Lionsgate made one of the biggest splashes yet when it launched the first Jigsaw trailer during the San Diego convention. And it arrived with shock and awe tactics that would make any gore hound proud. The movie looks like it's 80 minutes worth of fun death traps and about maybe about 12 minutes of exposition. Exactly what the fans want. Now we get a series of 'character' posters. If you want to call them that. They are grimy, greasy and just plain gross. Perhaps they're not too gory. But there is something unsettling about them. They make me want to throw up. The gist behind Saw 8 is that Jigsaw's legacy now belongs to the little guy. It's time for those of us who have been done wrong to take a stand, and kill, kill, kill! While having a little fun doing it. 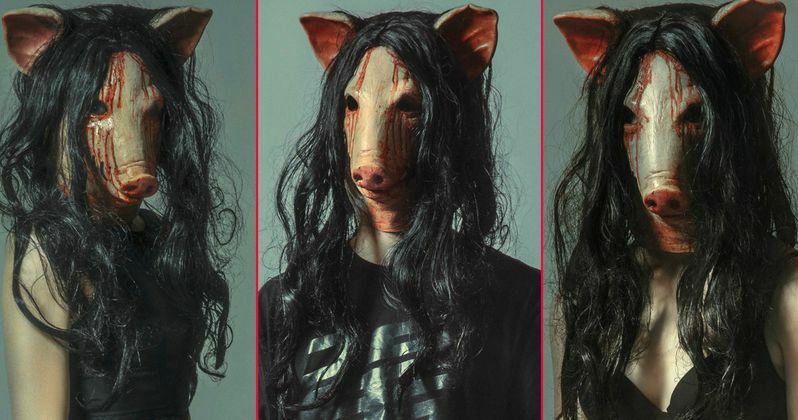 What's great about this latest campaign is how it's completely owned the severed pig head mask and made it something so identifiable with the Saw legacy. Despite the fact that the image itself is a total and blatant rip-off of the old 80s cult classic Motel Hell. Sure co-creator James Wan likes to say he never saw that movie before he and Leigh Whannell wrote and made the original Saw movie, but come on, that's ridiculous. Its like putting red shorts on a mouse then claiming you've never had anyone whisper the name Mickey in your ear. Oh, well, the Pig mask is a Saw thing now, and as these posters show, there is little Farmer Vincent can do to reclaim the gory glory that was once his. Lionsgate has provided a short, sweet synopsis for this latest piece of Jigsaw's puzzle. All you need to do is check out the trailer below to see that this holds true. Jigsaw will be in theaters the weekend of Halloween, starting October 27, 2017. The story takes place seven years after Saw: The Final Chapter. And it stars Laura Vandervoort (Bitten, Smallville) and Hannah Anderson (Shoot the Messenger, Lizzie Borden Took an Ax) in the leads. It was previously reported that Tobin Bell will be back as the main villain John Kramer, albeit via flashbacks as he's been dead since the third Saw movie, unless there is something sinister afoot that we don't yet know. Michael and Peter Spierig of Daybreakers fame are helming this latest installment. Pete Goldfinger and Josh Stolberg are penning the screenplay with help from original creators James Wan and Leigh Whannell. Producers include Mark Burg, Gregg Hoffman, and Oren Koules. As far as John Kramer is concerned, early reports on the film indicated that he'll be back in a limited capacity. Earlier set photos revealed that there will be some grave robbing going down in the opening moments of this next installment. And these bodies turn up all over the city. Each corpse has met their own unique demise. An investigation gets underway. And all fingers point to John Kramer, aka Jigsaw. But how can this be? Jigsaw has been dead for more than a decade. The belief is that an apprentice has stepped in to pick up the mantle left behind by Kramer. And the clues may lead to someone embedded within the investigation. Neither Costas Mandylor nor Cary Elwes, both exposed as Kramer apprentices in past installments, are returning in Jigsaw, unless their appearance is planned as a surprise for fans. Though not officially confirmed by Lionsgate, the rest of the cast is believed to include Mandela Van Peebles, Brittany Allen, Callum Keith Rennie, Matt Passmore, Hannah Emily Anderson, Josiah Black, Shaquan Lewis, Michael Bolsvert, and James Gomez. Jon Cor's Ryan from the last installment, 2010's Saw 3D, is rumored to be back in this sequel. Though it isn't known how much time he gets in the overall plot. Ryan was seen in the opening trap with Sebastian Pigot's Brad in Saw 7. Writers Patrick Melton and Marcus Dunstan previously revealed in that film's commentary track for the Blu-ray and DVD release, that it was Ryan and Brad who were wearing the pig masks at the end of the film, leading to speculation they may be the ones who unearth Jigsaw's grave in this new installment.Check out these vomitous new posters along with the trailer again in case you missed it.